Ok, I'm having a dickens of a time. I am relatively new to quilting and could use some advice. I recently completed my first small bargello (Yeah!) I did the border as directed and hated it. I felt it needed the mitered corners - which the directions didn't tell me how to do. I had decided to do a small solid border, then a strip border of the tubes and then a wider border of the first border fabric - like the directions called but just miter them. I found a youtube video that showed a woman sewing mitered corners, and she made it look so easy. She also recommended sewing the different edgings together and then mitering them. Which was great. Except when I did that with the recommended overages of fabric that she mentioned, I don't have enough fabric to make the corners meet. So now I'm trying to decide what to do. I can go back to the original plan, which I didn't like in the first place. I think it didn't feel right because I felt the pieced section needed to be mitered to make it join smoothly. I don't have any more tubes sewed together that I can simply cut more strips for (but I do have enough scraps that I could make another tube, and then use it.) I'm not sure I have enough of the outside border (but could make a trip to the quilt store). Plan 2 would be to make a new tube, cut more strips, and recut the borders to try and miter them. I'm still not 100% certain of my mitering skills. What seemed like a good idea at the time, has been an exercise in patience. Third idea I have is to do standard border of the solid pieces. I can sew the inner solid border, piece the strip section, and then do standard border of the outer solid piece. I'm not convinced it would look 100% right if I miter the middle but not the surrounding pieces. Advice desperately needed and appreciated. I really want to get the border on so I can take it to have it quilted. I've fallen in love with bargellos and decided that I will have them longarmed whenever possible. Please help. Thank you! When doing mitered corners, you need to extend the side border fabric the width of the end border fabric. I always give myself an extra inch beyond that measurement for a little fudge room in case I need to re-do the miter. You must measure your border width, plus seam allowances to get the extra amount you will need to add to the border lengths. Don't go by her measurements as your quilt top will be different. Try the sharonschambers video mitred corner part 2 the glue idea would hold without pins the beginning part one glueing the seam I assume yours is sewn. Do post a photo of your quilt so that we can see it and think of new border options for you. Sounds like you are missing corners at this point? Why not applique a Dresden fan onto corner squares in one of the colors of your top? 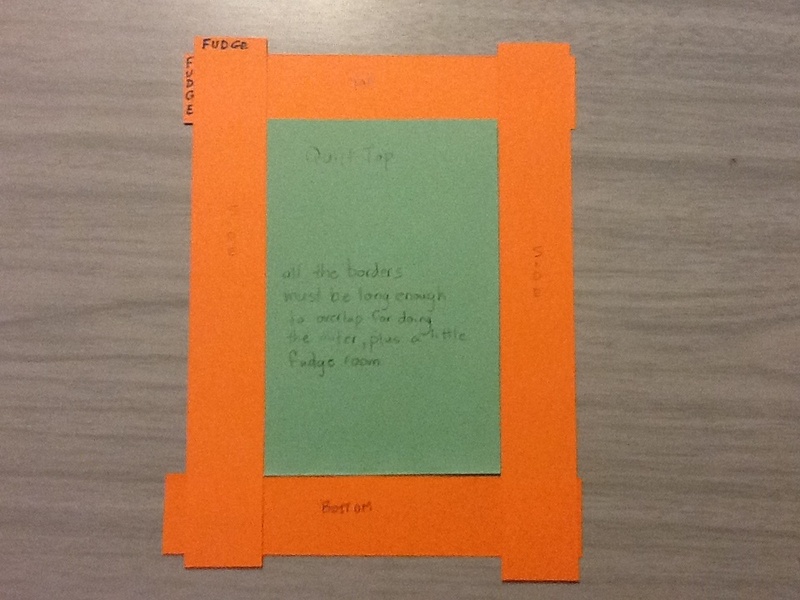 you may have more luck if you attach the 3 borders separately- you could *easily-once you learn how* miter the inner narrow solid border- add the strip borders straight- then miter the outer wider solid border. mitering the pieced section may be a bit difficult. practice mitering with a couple pieces of scrap fabric to get the hang of it- once you get it you will find miters are really not difficult- it's just learning the process. Could you use cornerstones? They may be easier for this quilt.